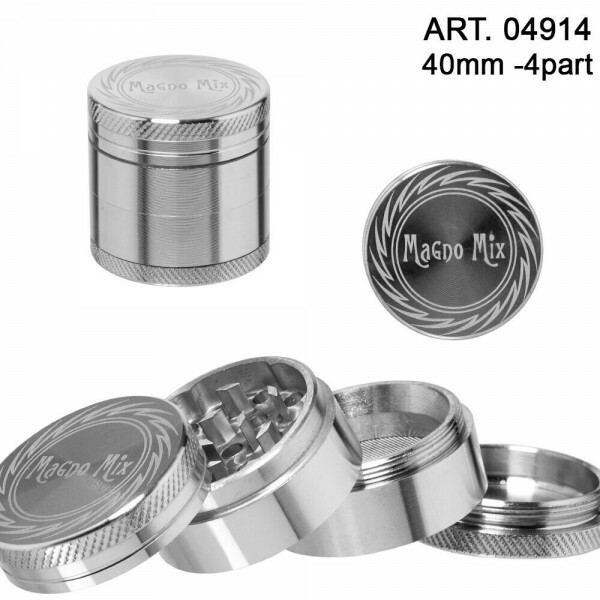 This Magno Mix grinder of 40mm diameter is an elegant accessory for your smoking kit! It is a compact device consisting of 4 distinct parts. The magnetized cover guarantees a secure fit while the nylon friction ring offers you a more convenient rotation. It includes also a sharp, diamond-shaped teeth bottom for a better herb grinding and a pollen screen along with a kief catcher bottom that will filter and collect all the remaining pollen, so as you can gather it and re-use it. With the Magno mix logo featuring upon the cover, it comes in silver color with 12 pieces per box.